In this instrumentation project we are dealing with the clinker cooling system in a cement manufacturing industry. Automation is the use of control systems (such as numerical control, programmable logic control and other industrial control systems), in concert with other applications of information technology (such as computer-aided technologies CAD, CAM, CAX), to control industrial machinery and processes, reducing the need for human intervention. In the scope of industrialization, automation is a step beyond mechanization. Whereas mechanization provided human operators with machinery to assist them with the muscular requirements as well. Processes and systems can also be automated. Automation plays an increasingly important role in the world economy and in daily experience. Engineers strive to combine automated devices with mathematical and organizational tools to create complex systems for a rapidly expanding range of applications and human activities. Clinker cooler is one of the inevitable part of cement manufacturing industry. Modern reciprocating grate coolers have made them more efficient too. Automated clinker cooler system is automated using programmable logic controller. In such plant, parameters such as temperature, speed of cooler drives, unhealthy conditions such as overload, stop, zero speed, low liquid level, low pressure, and no flow conditions are sensed, indicated and controlled. It also switch on the spray pump arrangement, in case of urgent cooling is needed. Usually thermocouple is used as temperature measurement equipment. To ensure efficiency programmable logic controllers are preferred. Delay in controller action may result in enormous losses. This is why PLC‘S are chosen over other electronic devices. Generally dc motors are used to drive clinker cooler, crusher, cooling fans, spray pump and VFD is used drive one cooling fan. Programmable logic controller (PLC) is employed to monitor and control the working of different section of clinker cooling system. The project deals with monitor and control clinker temperature to a level suitable for the subsequent equipment. 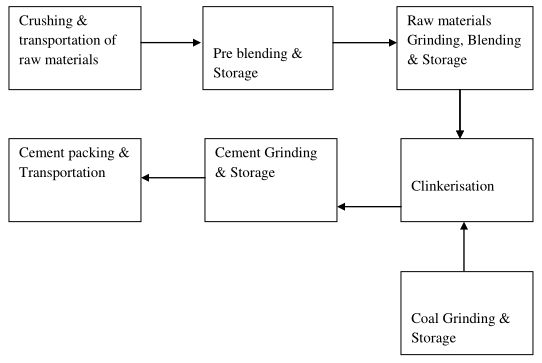 One of the serious issues in most cement manufacturing plants is the cooling of clinker which if not done effectively will disturb the whole manufacturing process . Low capacity systems pose less problems whereas large capacity systems are a major concern . In these systems , large-scale coolers present additional mechanical and process related challenges which have to be taken into consideration. For instance, the grate drive, poor visibility in case of dusty clinker and difficult to measure gas temperatures and flows are worth mentioning. These require equipment suppliers to have excellent process know how, close tolerance manufacturing capability and extensive assembly and commissioning experience. Furthermore, there is a growing tendency towards additional heat consumers using hot gas drawn from the cooler. Even more flexibility is required if the plant operation includes the use of different fuels in the burning process – a factor to be considered for clinker coolers of all capacities. The design can also be made more compact without reducing the efficiency. In this project, AUTOMATION OF CLINKER COOLING SYSTEM we are cooling the hot clinker (product obtained from rotary kiln) for further handling and for avoiding unwanted chemical reactions that affect the quality of cement. In MCL , the available PLC system for automation of various processes is that of ALLEN BRADLEY (SLC 5/04). We studied the situation and the requirements of the company and designed a program which could reduce the temperature of clinker to the desired level and control the overall operation . The program was written utilizing PLC supported ladder logic programming.The program was successfully entered and executed without anomalies. Moreover further scopes of the project was discussed among us and various suggestion regarding the improvement of existing instrumentation also evolved.